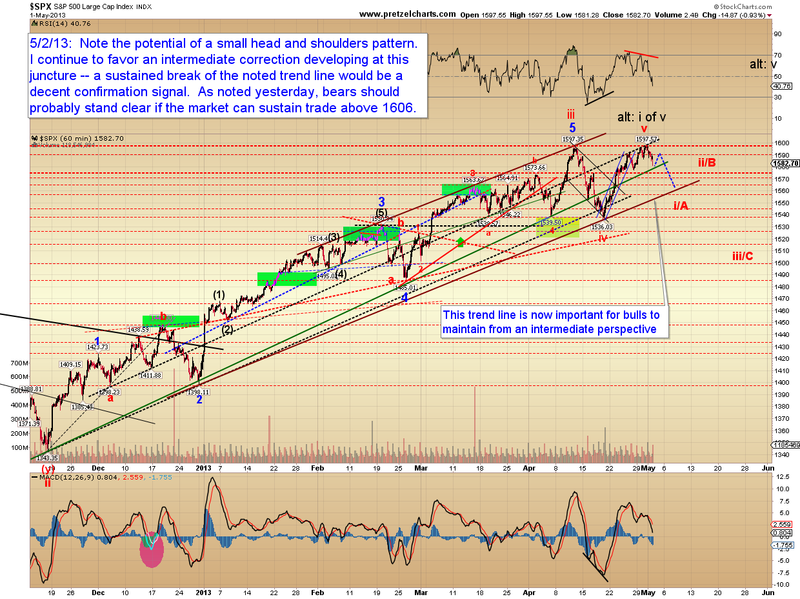 Pretzel Logic's Market Charts and Analysis: SPX and BKX: Will Bears Capitalize? 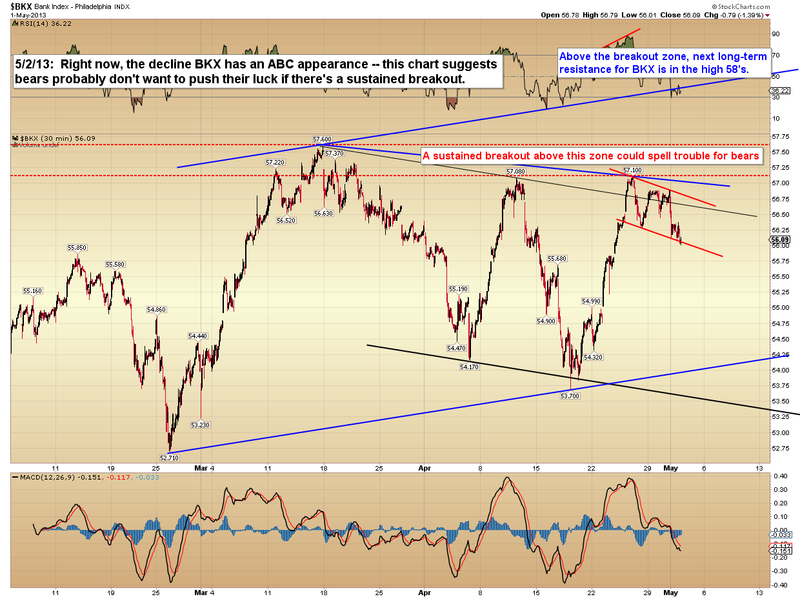 SPX and BKX: Will Bears Capitalize? Tomorrow's article is going to be titled "The Trouble with Bubbles," and will be a bit longer on words, so today's article is going to focus more on charts. Of course, I'm assuming I won't die of exhaustion between now and then -- if I don't make it through 'til tomorrow, then that article will probably be really short. Yesterday's near-term ending diagonal count appears to have been correct, although it ended a bit abruptly, about 4 points shy of the exact "perfect world" target, and the S&P 500 (SPX) declined directly off the open. With yesterday’s decline, bears have a good opportunity to shift the momentum, and have a defensible position at the 1600 zone -- now they have to continue to run with it. If my intermediate thesis is correct, then we appear to be wrapping up multiple degrees of fifth waves, which should be followed by the first lasting correction of 2013. It's too early to paint targets with anything but broad strokes -- in fact, to be fair, it's too early to confirm an intermediate correction has started at all. 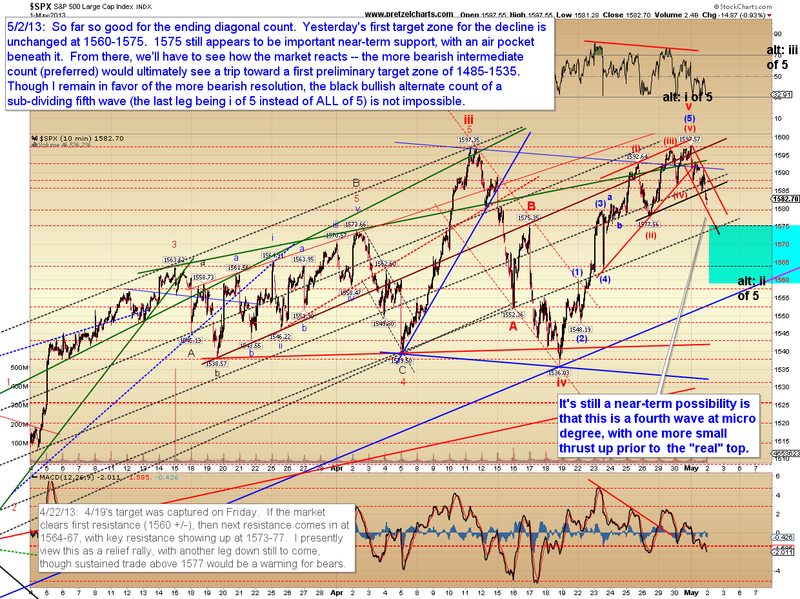 This is unabashed analytical front-running, and the bullish option is that this fifth wave is sub-dividing into a larger five-wave structure, which would mean we've only seen wave i of v so far (shown in black). I'm continuing to favor the more bearish intermediate view at present. It's also still not impossible that yesterday's decline was simply another micro fourth wave unraveling, with one more thrust up still to come. This is why I'm still watching the 1606 +/- zone, and depending on the shape of the next move, would probably not remain bearishly biased if the market can sustain a breakout. There's one chart which doesn't exactly "contradict" the bear case yet, but which does underscore the point that any breakouts should be respected; and that's the Philadelphia Bank Index (BKX). This chart really seems to be saying that bears probably don't want to stand in the way if there is a sustained breakout. The recent small correction in BKX also looks like an ABC at this exact moment, and there wasn't a significant momentum divergence at the high -- so BKX is worth watching going forward. 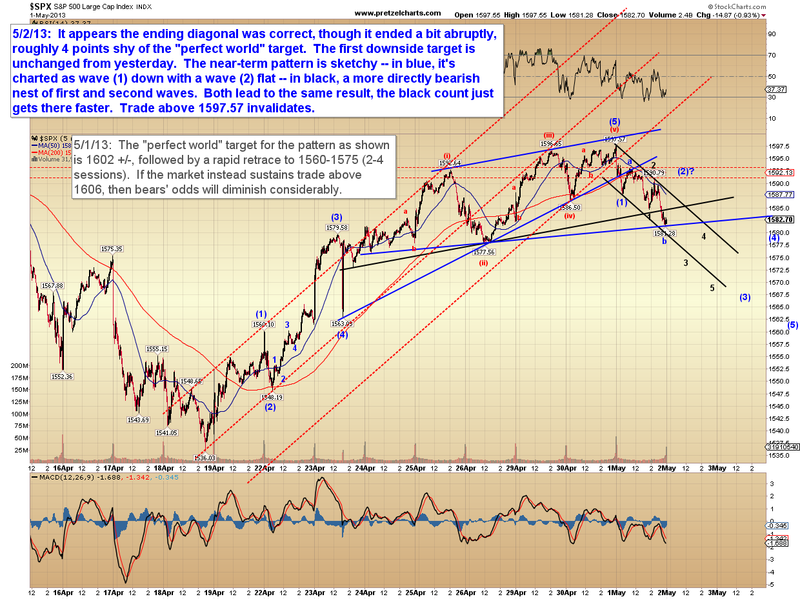 In conclusion, while the near-term pattern played out well, the market hasn't done anything to confirm the bear case at intermediate degree yet. We're a bit at the mercy of the market at the moment, since it hasn't given us anything solid in a while, and we've simply been cycling in a large trading range. Bears do have an opportunity to shift the momentum here, so the next few sessions will be important. Trade safe.